The UCLA Paul I. and Hisako Terasaki Center for Japanese Studies is committed to uniting scholars, students, and the community in efforts to understand Japan in global and historical contexts. The Center supports faculty, students, and other specialists in Japanese Studies and shares its expertise through campus and community programming. for the terasaki center for japanese studies kamon, we have joined two flower motifs—the california poppy (outer) and the japanese cherry blossom (inner). this idea of cross-pollination emphasizes terasaki center's primary goal: expanding academic discourse of the complex relationship between japan and the united states. The UCLA Center for Japanese Studies was created in 1991. The original goal of its creators was to enhance and develop an infrastructure for Japanese Studies at UCLA. At the same time the Center committed itself to the training of a new generation of scholars working on Japan. A further goal was to provide greater national visibility for UCLA's Japanese Studies Programs and to cooperate with other groups and institutions in the broader field of Japanese Studies in the United States. Emerging as it did after the complex period of Japanese-American relations in the 1980s, it furthermore committed itself to providing an academic understanding of the U.S.- Japan relationship. A final goal of the Center was to attract sufficient funding to support a vigorous Japan centered program and to serve as an advocate on campus for the faculty and student support needed to develop Japanese Studies at UCLA. These have included a regular monthly Colloquium Series that has brought to UCLA some of the leading Japan specialists of the older generation in the U.S. and Japan, as well as many cutting edge scholars of the younger generation working on Japan. The Colloquium Series has been committed to a broad based coverage of Japan and has included a wide range of topics that deal with Japanese art, culture, history, society, and politics. To date the Center has provided graduate fellowship support for over 40 students who have taken their Ph.D.s in Japan related fields. Its annual graduate student funding is now over 250,000 dollars. Generous donors have provided the Center with a variety of fellowships that include the Aratani "Field Experience" fellowships, the Kawahara, "Professional" fellowships, and the Sasakawa Fellowships. Several recruiting fellowships have also been created. An annual Graduate Student Symposium has been established that brings to UCLA advanced graduate students and commentators from around the country. At the same time the Center has become a major supporter of faculty research through its Faculty Grants Program. Such grants have included funding for individual research projects as well as numerous conferences held at UCLA. Occasionally support has gone to publications dealing with Japan. The Center has enhanced teaching at UCLA by providing a wide array of audio-visual teaching materials for the Japan faculty. It has also supported the collection and processing of materials for the Richard C. Rudolph East Asian Library at UCLA and was instrumental in providing UCLA with a major collection of Japanese works donated by the wife of Marius Jansen of Princeton University. Most recently the Center collaborated with the UCLA Library to purchase The Gordon W. Prange Collection in microfilm. Details to be announced. It has also supported staff development projects in the library. The Center has actively cooperated with Los Angeles institutions to present Japan related events. These include the Japan Foundation, the Los Angeles County Museum of Art, the Japan-America Society, the Japanese American National Museum as well as UCLA's Wight, Hammer, and Fowler museums and galleries. Several annual conferences have also been established, including the Nikkei-Bruin Conference, which was generously funded by a group of Japanese-American alumni (the Nikkei Bruins) at UCLA. Along similar lines, an annual Visiting Professorship in U.S.-Japan Relations was established through the endowed gift of a Chair in U.S.-Japan Relations given to the Center by Paul Terasakiin 1998. In 2005 the Center was renamed the Paul I. and Hisako Terasaki Center for Japanese Studies to commemorate a major endowment from the Paul I. And Hisako Terasaki Foundation. The goal of the Terasaki gift is to enhance the Center's work on Contemporary Japan. With the added endowment the Center's program has expanded in several new directions: these include a new Terasaki Chair for the Contemporary Study of Japan, a Terasaki Community Outreach Program, and the Terasaki Postdoctoral Fellowship. A part of the new program will also enhance UCLA's cooperative efforts with Japan-related programs at other institutions. 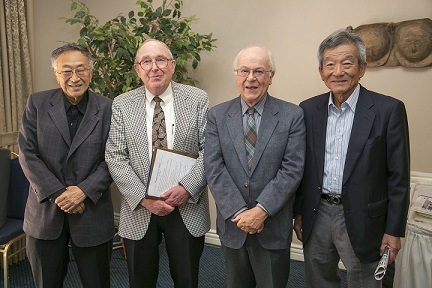 From left to right: Dr. Paul Terasaki, Professor Fred Notehelfer, Professor Don McCallum, and Mr. Herb Kawahara at the Terasaki Center Founder’s Luncheon. 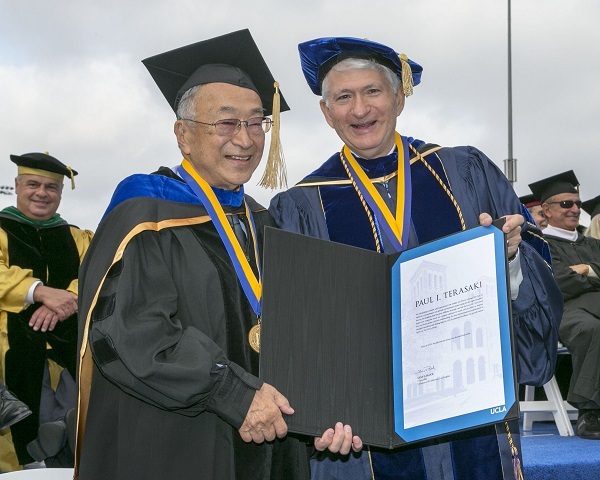 Dr. Paul Ichiro Terasaki was awarded the UCLA Medal, the university's highest honor, at the UCLA College of Letters and Science commencement ceremony on June 15, 2012. 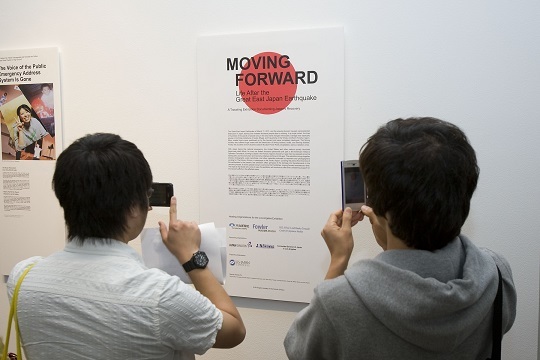 The Terasaki Center coordinated a traveling exhibition to commemorate the 2011 Great East Japan Earthquake. The exhibit was held in Little Tokyo, the Japanese Embassy in Washington D.C, the University of Chicago, and the UCLA Fowler Museum.